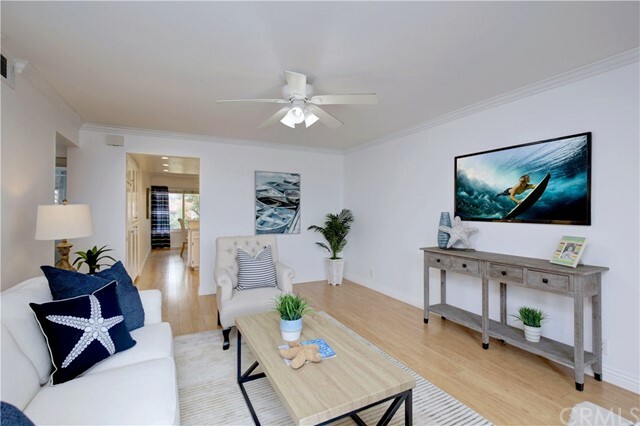 Stunningly remodeled, fully furnished modern end unit in the gated community of villas del mar, just a few short blocks to the beaches at surf city usa, huntington beach. Modern upgrades and materials throughout with chic color pallet along with designer furnishings and contemporary lighting fixtures compliment the bright and open floor plan. The chef’s kitchen features fresh white cabinets and drawers with soft close, stainless appliances, quartz counter tops, tile back splash and farmhouse sink with separate eating area. The expansive living room flows seamlessly from the kitchen and is highlighted by the stacked stone fireplace with curve tv. A remodeled powder room and separate laundry room complete the main level. Upstairs are two bedrooms, each with their own en-suite bathroom, ample closet space and mirrored closet doors. The master suite also features a private walk-out balcony. The home includes a one car garage and additional assigned parking space with two beach cruisers and lots of storage. Relax or on own private patio or enjoy villas del mar’s spa like amenities including community pool, spa, outdoor cooking and fitness center. Not only a close walk to world-class beaches and surfing but one block to the award-winning dining, shopping & entertainment of main st. And close to schools. An amazing place to call home or an incredible opportunity to find a fully furnished beach-house as a second home or investment property. Gorgeous pacific ranch!! 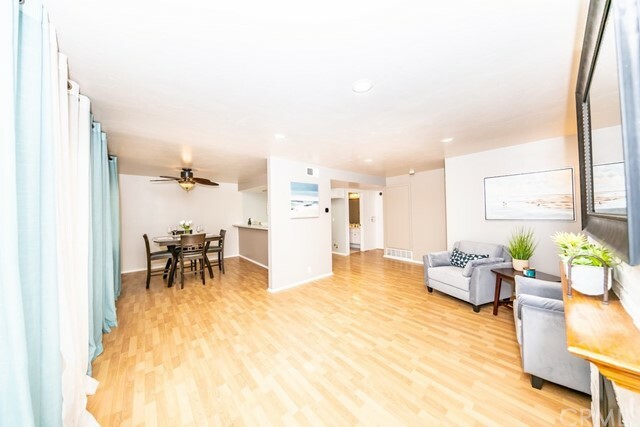 Must see popular pacifica model (2bd/2ba plus loft) with large balcony overlooking a greenbelt and trees (not looking directly at neighbor)--a nice interior location! Custom shutters, soaring/vaulted ceilings, custom ceramic tile and travertine throughout, newer carpet, tiled breakfast bar, inside laundry, fireplace, large master suite, detached 1 car garage plus covered carport and much more! The loft has been turned into a 3rd bedroom with closet. Pacific ranch is guard gated, has 3 pools/spas and clubhouses and is walking/biking distance to the beach, pacific city, nature trail, schools, downtown shops and restaurants, hbhs and seacliff shopping center. Live a resort lifestyle! 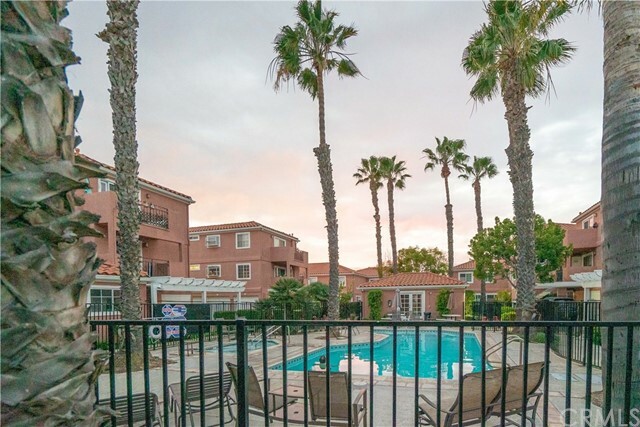 Townsquare condominiums is a boutique resort style development built in 1990 and it is just 3 blocks from the huntington beach pier, beach, and over 40 restaurants & shops. Plus the new pacific city development at pch & 1st street. 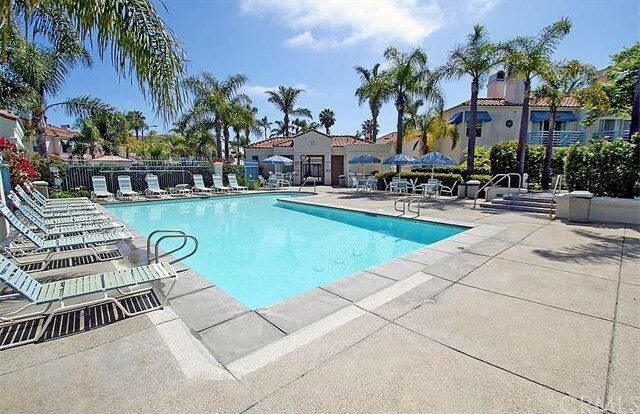 The complex is gated and has secured parking, so you can enjoy being in the downtown hb village area. But at the same time there will always be parking when you get home. This is one of the rarely available plan b (1,038 sqft) 3rd floor (top) units with the west facing orientation! The unit looks out over the swimming pool and palm trees for that tropical feel. And the balcony is a perfect place to watch the sunset every evening. This unit is perfect for year-around living or a second home. With all the restaurants and shops just a short stroll away, you would not even need a car! The unit has a very bright and open 2 bedroom, 1. 5 bath floorplan breakfast counter, fireplace, and balcony off the livingroom. The kitchen is spacious with ample counter space and a stacked washer/dryer closet. The master bedroom is light & bright with a slider leading out to the balcony, walk-in closet, and spacious master bathroom. Highly desirable 2 bedroom, 2 bathroom condo one block from the shops and restaurants of main street and just three blocks from the ocean. Pacific city shopping and the hb pier are literally right in your backyard! This highly upgraded home sits in one of the most private locations in the building. 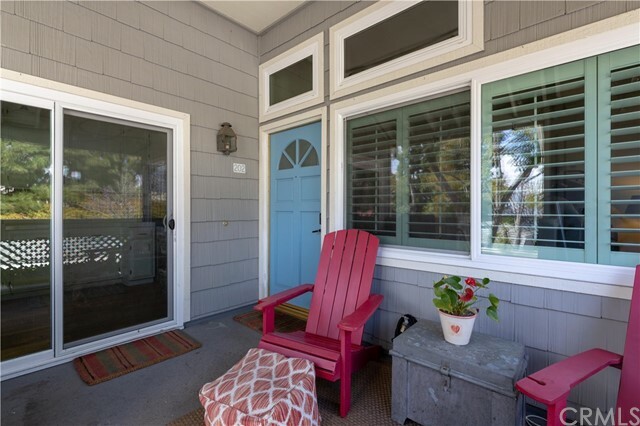 This gorgeous home comes with granite counters, upgraded bamboo wood flooring, upgraded bathrooms and an extra large storage unit at the patio perfect for bikes and surfboards. New dual paned windows and sliders throughout were just installed along with a portable air conditioning unit. Large master bedroom opens to a large wrap around patio which is also accessed by the living room. Huntington bayshore hoa is private and gated offering a community pool, spa and recreation room. Gated underground parking comes with two assigned parking spaces right next to steps or elevator leading to your private front door. Lots of guest parking and electric vehicle charging is available. This is the home for you. Live the dream in huntington beach! Upper end unit condo in highly desirable pacific ranch! Unit features open concept, high ceilings, hardwood floors, natural light, and cozy fireplace in living room. Kitchen has upgraded stainless steel appliances, white cabinets, wood floors, pantry storage, and slider to patio. Large master has ample closet space, vaulted ceilings, and separate vanity area. Large secondary bedroom with double door entry. Inside stackable laundry unit adds convenience. Large patio deck is perfect for entertaining. Private location with 1 car garage, 1 carport space, and 2 storage closets. Beautiful resort-like community walking distance to shopping, restaurants, and a short ride to the beach. Beautiful 2 bedroom downtown upstairs condo in the beach close gated community of las brisas. Large & bright the front patio welcomes you with a view of the resort style pool and spa. 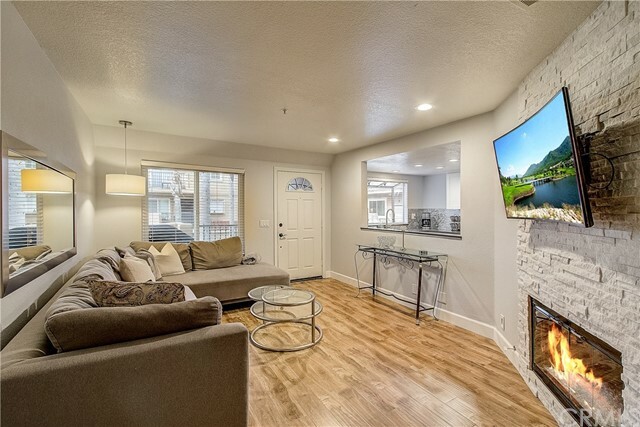 Step through your door front to the open & spacious living room with sliding glass doors to the front patio, engineered wood flooring, new paint, and a ceiling fan. Walk into spacious kitchen with white counters, newly painted cabinets, ceiling fan, bar seating, double stainless steel sink, built in microwave & ample storage. Large dining area could also be used as a family room. The spacious east facing sun drenched master bedroom offers mirrored closet doors, plush carpet and a designer ceiling fan. The master bath has beautiful white counters, dark wood cabinets and large walk in shower combination. This home offers inside laundry, ceiling fans in every room newly painted and new mirrored closet doors. Las brisas community is gated with pool and spa. Walk to the beach, downtown, parks, schools and right across the street from the new pacific city. This a wonderful location in the complex. When it comes to living at the beach, location is everything! Situated in the secure gated community of pier pointe, this property is one block from main street and the seacliff village shopping center. 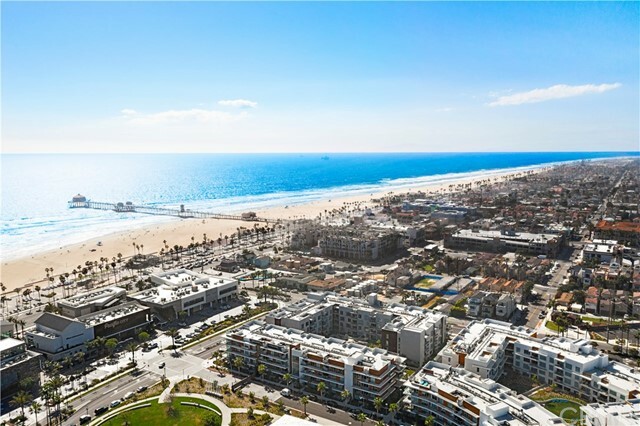 This ideal location makes for a quick bike ride to the pier, downtown huntington beach, the upscale shops, and restaurants at pacific city. This home has been upgraded with new appliances new replace furnace and a master bathroom that is to die for. The bright white kitchen, open concept floor plan, a private patio seating area, and kitchen bar make for the perfect space to entertain guests. This house offers an interior laundry area, fireplace, single car garage with an additional parking space that most units don't have. The home features access to the clubhouse, ample green space, and a community pool within the complex. You will have all the amenities of a single-family residence with low maintenance and security of a private community. 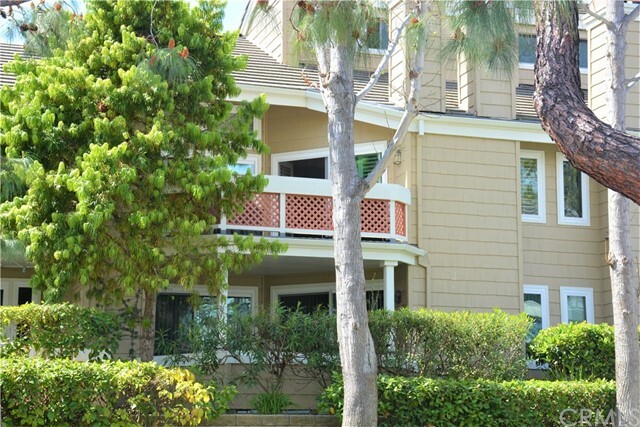 Gorgeous three bedroom, two bathroom condo near downtown huntington beach in the wonderful community of brisas del mar! These condo's where converted in 1993 please confirm with the city the exact date. This charming third floor condo boasts a light, bright, and airy feel right as you walk through the front door. Upon arrival, you are greeted by the expansive floor plan that starts from the entry to the spacious living room. This property prides itself with a generous en suite master bedroom including private access, spacious second and third bedrooms, vaulted ceilings in every room, laminate flooring, two bathrooms with shower/tub, and a private covered patio with sliding glass door where stunning sunsets can be viewed. Additional features include new custom levolor blinds on all windows and sliding glass door, a garage close to the property with built in storage and new garage door/door opener, and one additional reserved parking space. The community includes stylish tuscan style exterior, lush landscaping, laundry areas, pool/spa, community clubhouse, and plenty of parking. This fantastic condo is in an amazing location just a few blocks from the ocean, huntington beach high school, and newly built outdoor mall pacific city. Property is part of the city of huntington beach's affordable ownership housing program. Please see supplement section for additional information. Moderate income restrictions.